A course about connecting your ASUSTOR NAS to the Internet using EZ-Connect. A course about manually configuring your NAS's connection to the Internet. Learn how to set up and use EZ Sync here! A course about using the Remote app to stream and play music from your NAS. Learn how manage photos and albums on your ASUSTOR NAS using AiFoto and your mobile device. You can learn how to install Plex on your NAS. Using Apple TV to play videos straight from your NAS. An overview of RAID and creating RAID volumes on the NAS. 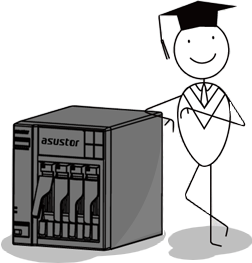 Learn how to use Backup Plan with your ASUSTOR NAS. Learn how to use Dropbox on your ASUSTOR NAS. Learn how to create and execute Rsync backup jobs to a remote ASUSTOR NAS. An overview of Surveillance Center's various settings. Learn how to automate your torrent downloads using RSS feeds and Download Center.